FLYING @ CIRCUS …… PERFORMANCES HEAT UP !!!! The warm spring days are now upon us… and the athletes on fiberglass are enjoying heated up performances this past week. The past 5 weeks have been filled with drills…short run up technical vaulting…sand pit straight vault drills and foundation work with small grips.. Now it’s time to raise the bar and hit your mid-marks. The best part of the year is about to begin for the 112 Flying Circus Dare-Devils on Fiberglass. It’s No Regrets Time!!! Reported results are coming in by e-mail everyday and we will post up as much as we can….. and as quickly as we can.. It’s important to keep up with your team mates…because the day belongs to you. Keep training HARD!!! In todays Jack Yonkers Bergen County Relays Championships…the stars came out…as Northern Valley-Demarest,NJ Girls Vault team of Erin Yuder,Caitlin Reverand and Michelle Rubinetti set a New Bergen County Relay Record of 32 Feet and tied the New Jersey State 3 Girl Record of Hunterdon Central last year !!! Coach Mike Ives had the girls ready..with Erin sailing 9′ 6″ Caitlin leaping 11′ 0″ and Michelle soaring 11′ 6″ at Mahwah High School’s track.. Over inRidgewood in the Relayy A Division.. it was Ridgewood,NJ vault crew and Pascack Valley tying at 28′ 0″ as Nicole Lester 10′ 6″ Maxine Earl 10′ 6′ and Kerry Callaghan 7′ 0″ for the Maroons. Up at Bethlehem High School… The Lady Eagles are scoring big points this spring in all events…but it was senior Tedi DeMaria(BC) soaring 12′ 0″ for Coach Ashley Gansel in the pole vault to set a New Track Best on the newly installed track complex ..along with her horizontal jump duties. She is one of 8 Circus Girls invited to the 122nd PENN RELAYS next Thursday at Franklin Field,Philly!!!! Just down the street…at good old Warwick Valley High …..the warm day produced 8 Personal bests at the Valley Central vs Warwick Valley Shootout…… Junior Issac Heatley…coming off his 3rd place finish in the New York relays on saturday..Flew 13′ 7″ PR for the gold…Sophomore team mate Dane Sorensen hit 12′ 7″PR..Breandan McShane(Warwick) PR’d at 11′ 7″ and Jacob Becher(Warwick) cleared 8′ 7″ for the Wildcats. Kniernam McCarthy(VC) flew 11′ 1″ for the Vikings!! In the Girls meet..8th grader Genevieve Reilly hit 8′ 1″ PR for gold…Freshman Kaeli Thompson(Warwick) sailed 7’7″ for silver and Jenny Prial(Warwick) hit 6′ 1″ for the sweep. Reilly had one close jump at the All Time Warwick Middle School record of 8′ 7″!!! 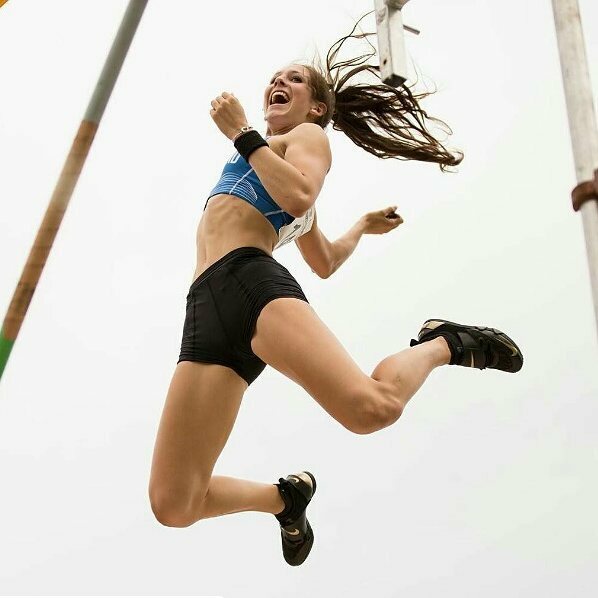 New Jersey’s Caroline McGann(Holy Angles,nJ) just a soph is putting the vault together..with another school record jump of 10′ 6″…and Pascack Valley’s Melissa Purcell9Soph-) soared 11′ 0″ PR for Coach Tim Wilson Fair Lawn,NJ Junior Jessica Ippolito sailed 11′ 0″ as. did Madesyn Hawkins(Coughlin,PA) this week and Lia Zavatarrlo(Greenwich,CT) sailed school record in her first meet of spring!!! The New York Relays at Icahn Stadium on Saturday was a special day for Lauren Russo(Newtown,CT).. with her pole vault win at 11′ 0″ for Coach Duffy and Coach Russell… Also hitting Gold was Reese Schachne Charles of Staples ,CT with a huge Javelin win at 128′ 3″!!!!!! All the way out West..it was a wonderful day of vaulting for Duke University senior Megan Clark…as she set another Duke Outdoor record of 14′ 1″ for the MT SAC Invite win!!!! Megan will be at this years PENN RELAYS on Thursday April 28th at 3PM Start !!!! “SUPER VAULT SUNDAYS”….. are just that !!!!! Join us every Sunday for the fun and friendship of group vaulting..We now run our 3 outdoor pits and 2 Indoor pits and NEW SAND VAULTING PITS !!! Girls Group Vaulting at 12:30-2PM….Boys Group Open Vaulting at 2-3:30PM … Cost …STILL JUST $30 and FREE PARKING,Wi-Fi, Music and Bathrooms!!!!!! “WHO YOU GONNA CALL” ….. FLYING CIRCUS !!!!! GREAT POLE VAULTING MEET COMING …. JOIN the FUN !!!! Click below to view the information and entry form for the 2016 Andy Washnik Pole Vault festival on Sunday May 8th @ Mahwah High School!